This Error Message Article explains the BarTender Librarian message “Operation Failed: Couldn’t unlock vault object. The file has been checked out by another user.” and details how to fix the underlying problem that caused it to appear. This is an normal message. It indicates that someone else has the file checked out. You are trying to perform operation that is not allowed on the file (delete, rename, modify, etc.). 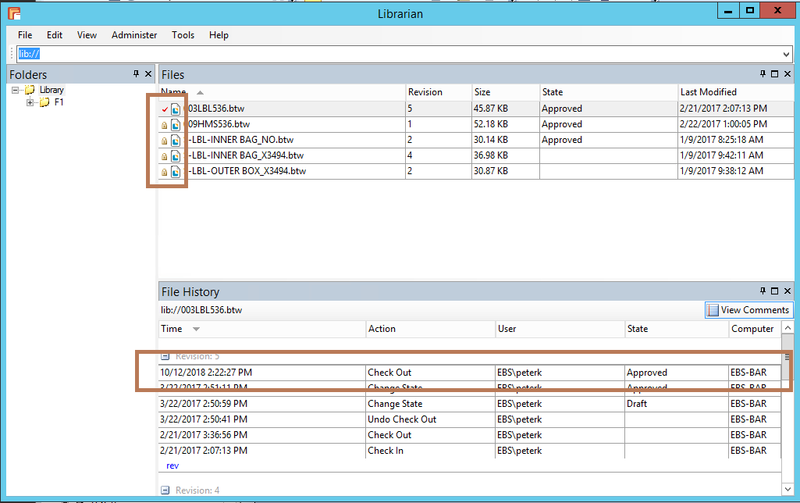 In Librarian view, a check-out document will have a check mark in front of the filename and the User-ID of the person who checked out the document is listed in the File History section. Ask the person who checked out the document to either check it back in or undo-checkout.